The Days of Johann, an agility dog! : Those darn cats! 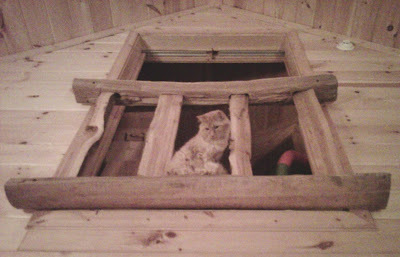 This is Wiggy, up in the balcony overlooking our living area. He's up in the bedroom, looking down on me and teasing the heck out of me! I bark and I bark and I bark!!! Then when I can stand it anymore and all the racket makes Mum want beyerdynamic headphones, I run upstairs and try to herd him outta there! Cats are evil. I bet he doesn't even get in trouble for making you bark, but you get in trouble for barking.